The Business Analysts Handbook has been launched by myself and a handful of friends and colleagues. 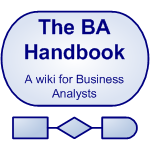 From it's homepage; "This is a wiki for busness analysts to post thir knowledge. It is designed to be an evolving repository of knowledge for and about business analysts, or BAs." This site can be viewed as a business analysts body of knowledge, although rather that a formal and rigidly version controlled document such as PMIs PMBOK (or the proposed BABOK) my hope is that the wiki format will enable a broader contribution from practitioners and be a (cliché warning) live document, that evolves as the knowledge base grows.